What a stupendous catch, Carin! And what fun – it evokes all kinds of summer feelings! 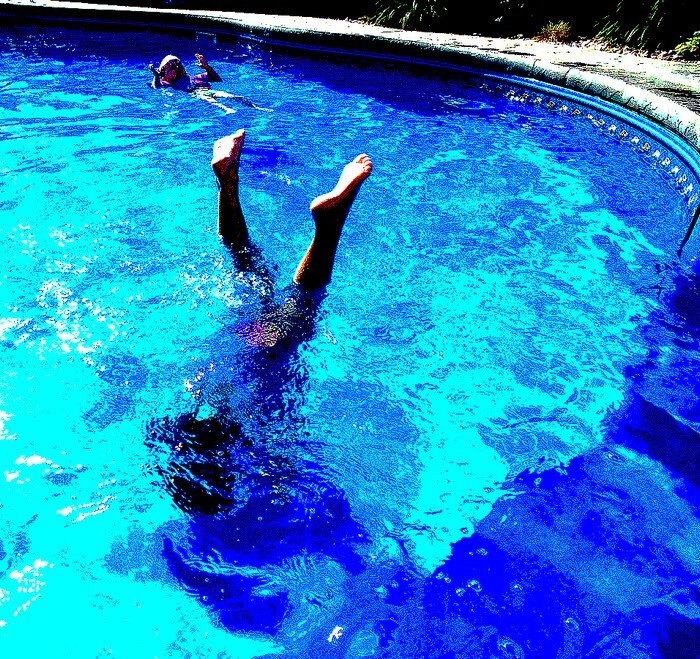 Oh gadzooks … I ‘remember when’ but not in a pool. Ipperwash Beach was the favourite spot way back then. Love this … so refreshing in so many ways. Colour. Composition. POV. Are you referring to some kind of Handstanding Champion of Ipperwash Beach status?? Oh, what fun!!! So joyous, so summery! I love how it’s the FEET that first catch the eye as one clicks on, those happy happy feet! Great picture. Oh! Wish I could be a child again. Great capture. Oh my! I LOVE this!! Both of them, just want to squat them, as some say in Newfoundland, and join them for zen floating and handstands. And apart from that, the photo is just so pellucidly blue and cool and like the very best dream you ever had. And I love that term: squat them!